It’s as if Christophe Claret and his team of horology boffins deliberately set out to create a watch, which at its core, uses the arch enemy of horological mechanisms – magnetism. Christophe Claret’s determination to continue pushing the boundaries of mechanical watchmaking and integrating scientific fields of research never previously applied in horology remains undimmed. The new X-TREM collection we are told, will be exceptional in all ways. X-TREM-1 features a tourbillon timepiece and uses magnetic fields to create the illusion of hour and minute indicators simply floating through the air. 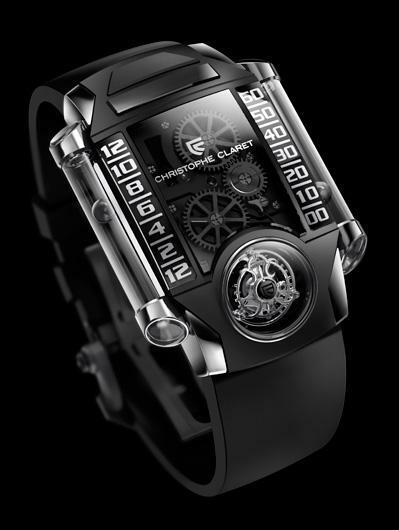 Christophe Claret has achieved that by creating a system where two small steel spheres – hollowed to make them lighter – encased within two sapphire tubes placed to the right and left of the caseband, are controlled by precision magnetic fields generated by two miniature magnets moved by cables. The cables are made from an extremely thin and strong woven silk thread more commonly seen in reparative surgery. The resistance of the thread has been tested in the Manufacture Claret on an accelerated-wear simulator corresponding to six years of operation. The spheres have no mechanical connection with the movement, with each one floating inside the two tubes and creating outstanding horological magic. The “floating” sphere display system of the X-TREM-1 is not the only technical feat involved. The entire construction and finishing of this timepiece meets the extreme demands expected if the watch is to bear the Christophe Claret marque. Ultra-light titanium was used for the three-dimensional curvex mainplate and the bridges. The case is composed of titanium and white or red gold, or platinum, and produced in a limited series of eight per model. The flying tourbillon is fitted with double ceramic bearings to enhance its shock-resistance. It is inclined at a 30-degree angle in order to make it even more clearly visible to the wearer. The hand-wound watch draws its energy from two barrels without disturbing the rate of the tourbillon, and thus the accuracy of the watch. Christophe Claret is never happier than when he is developing a new watch project that has never been attempted. The brand is resolutely dedicated to technological innovation to offer innovative and ingenious new ways of reading the time. 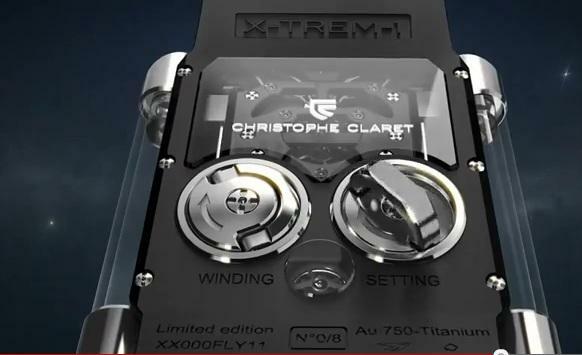 With the unveiling of the X-TREM-1 timepiece, Christophe Claret proves once again that watchmakers are some of the most incredible engineers on the planet. The magic of the new X-TREM-1 will be displayed at Baselworld in just a few days time. Meanwhile the video below gives an idea of the achievement.